The Brookview Pirate Run 5K/10K course loops from the Brookview School campus through the beautiful Benton Township River Park along the St. Joseph River. Ye might even spy a pirate or two... argh matey! 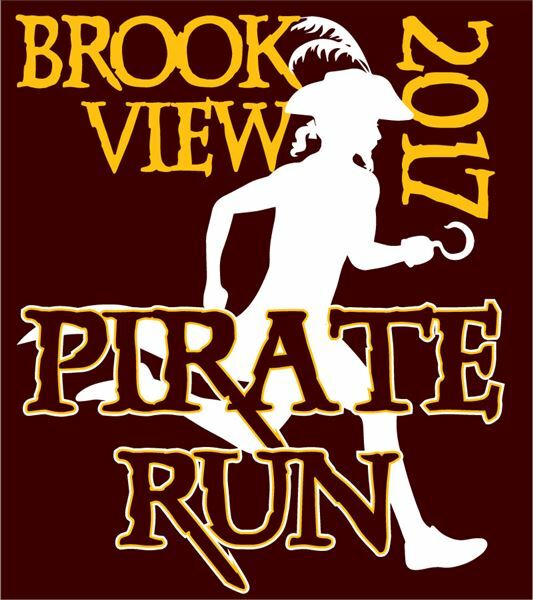 After hosting a 5K in April for 3 years, in 2014 the Brookview School Annual 5K moved to September, added a Pirate theme, and a 10K run option. Participants have the option to run or walk the 5K distance. Runners may choose to complete two laps of the route for a 10K distance. The pirate theme proved to be popular, with both kids and adults alike getting into the fun and donning pirate costumes! The 5K/10K course loops from Brookview Montessori School through the beautiful Benton Township River Park along the St. Joseph River, then back up the hill and down Zollar Road to Somerleyton Road before returning back to cross the finish line in the school parking lot. Awards to Overall Female and Male finishers in 5K Run, 5K Walk and 10K Run. Age group winners receive medals. This family friendly event is open to adults and children of all ages. Kids pushed in strollers are free! Or kids can participate in a 1K Kids’ Fun Run at 8:30 am, before the timed events. Supervised play is also provided for kids during the race. Register on race day with cash or check.The event is timed, using a web based app, with finish times available online onsite.